From left to right : Victor Crest, President, Association des étudiants de HEC Montréal (AEHEC), Lili Loiselle-Cantin, Executive Vice-President, AEHEC, Anthony Dubé, Vice-President, Events, CSL Prophecy, Pierre Bruneau, Founder, Fondation Centre de cancérologie Charles-Bruneau, Cynthia Tenga, Vice-President, Logistics, CSL Prophecy, Valérie Vigneault, Community and Partners Relations Officer, Fondation Centre de cancérologie Charles-Bruneau. 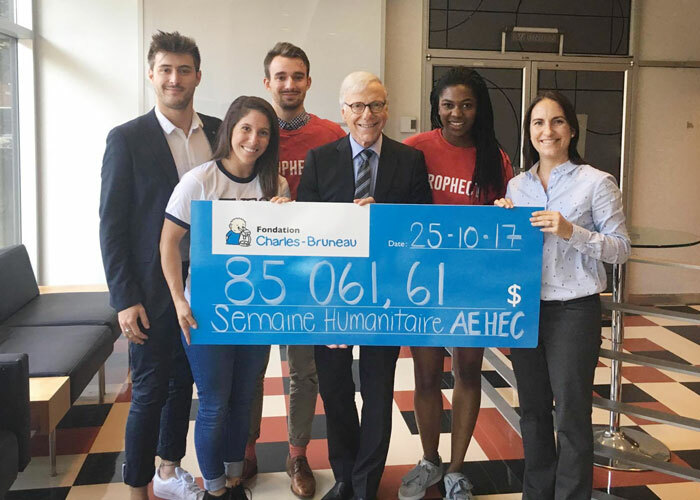 As part of the humanitarian week organized by the HEC Montréal student association (AEHEC) in co-operation with one of its committees, CSL Prophecy, students in the HEC Montréal Bachelor’s in Business Administration (BBA) program raised $85,061 for the Fondation Centre de cancérologie Charles‐Bruneau. The Fondation Centre de cancérologie Charles-Bruneau, created in 1990, is exclusively dedicated to fighting pediatric cancer in Quebec. It funds research and invests in all the university hospitals in Quebec that treat these children, to help keep their facilities on the cutting edge and well adapted to families’ needs.